It's very rare to find a toffee that's practically perfect in every way. A lot of toffees are too crunchy or too chewy, too hard or too thick, too sweet or even too bland. When picking up a piece of toffee, it's just so hard to predict whether you'll like it or not. However, with Tiddleywink Toffee, you can rest assured that every piece of toffee tastes like a little slice of heaven. No matter if you chose to indulge in their milk chocolate walnut flavor or their dark chocolate pretzel variety, every bite of these sweet toffee pieces is absolutely perfect. 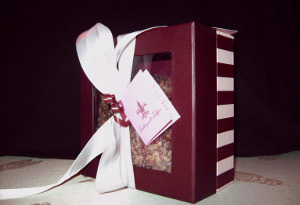 Each piece of Tiddleywink Toffee has the perfect thickness and a wonderfully pleasant crunch. None of the pieces are too large or too small, making them perfect for individual snacking or sharing with a crowd of people. The toffee is easy to chew and doesn't stick to your teeth as much as other kinds and brands of toffee do. As far as taste, you really can't beat Tiddleywink Toffee. Upon first opening the bags of toffee, the first thing you'll notice is the smell of the chocolate coatings and, in the case of the milk chocolate variety, the walnut pieces. However, this definitely does not mean that the brown toffee layer itself is tasteless. While the toffee may not be overly sweet, it does have a mouth-watering and buttery caramel flavor. The walnut and pretzel toppings add the perfect amount of saltiness to the otherwise sweet treats, not to mention a different kind of crunch. Because the pieces aren't super sweet, it's really easy to eat a large handful of toffee in one sitting. Personally, I always prefer homemade sweets and treats to those you can buy at the store or a bakery. I think the reason why I like both of Tiddleywink Toffee's varieties so much is because they're made from the Tiddleywink Toffee owner's family toffee recipe so they taste homemade. It's that homemade aspect that really gives Tiddleywink Toffee's sweets an extra special touch. You really have never tasted such a simply sweet toffee like this before. If you have a chance, I definitely encourage you to order a batch (or two) for yourself. I guarantee that you'll love every bite. We're giving away four boxes of Tiddleywink Toffee here on TheBestDessertRecipes! Make sure to get your entry in between January 20th and February 2nd, 2014 for your chance to win!